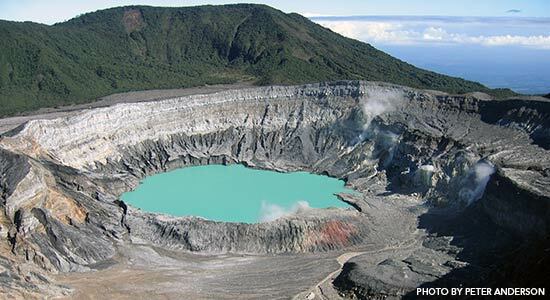 Located in a hot zone for volcanic activity, Costa Rica holds some of the most tremendous volcanos on the planet. With many still active, they draw in thousands of visitors every year, and with good reason. Each volcano holds something unique and beautiful, and they each have their own story to tell. The variety of volcanos in Costa Rica allows for a learning adventure of a lifetime, so start the journey with some stories and information about five of Costa Rica’s active volcanoes. Located northwest of San José, this volcano is one of the most well known in the country. 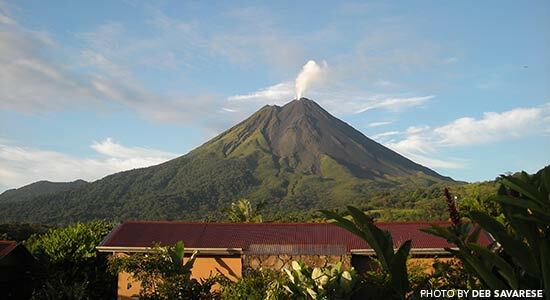 Though it is currently in a resting period, Arenal was Costa Rica’s most active volcano for 43 years, up until 2010, with its largest recorded eruption in 1968. Situated on the eastern shore of Lake Arenal, the volcano is surrounded by rolling green pastures, making its 5,437 feet look even more ominous. The volcano and surrounding land make up Arenal Volcano National Park, which boasts lush forests and astounding lava fields from Arenal’s eruptions. 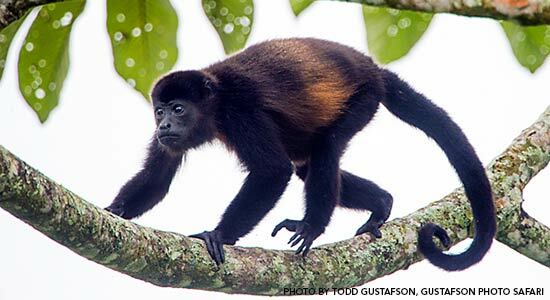 Despite the past eruptions and lava spew, the flora and fauna surrounding Arenal is still diverse and plentiful, including white-faced capuchin monkeys, macaws, and endemic plants including various bromeliads. To see the ecosystem around Arenal, there are various hikes as well as hanging canopy bridges to walk through the tree tops. The enchanting volcano is one of Costa Rica’s most sought after natural wonders, and its power and beauty will impress and awe any traveler. Standing at 11,260 feet tall, Irazú Volcano is the tallest volcano in Costa Rica. Located in Irazú Volcano National Park, this volcano is often thought of as the nation’s most important volcano due to its enrichment of surrounding soil. The volcano’s most famous recent eruption occurred on March 19, 1963 on the same day President John F. Kennedy arrived in Costa Rica for a visit. Since then, its most recent eruption was in 1996, but the volcano is still active. Irazú has several craters, creating a sort of moonscape. The two main craters are the Main Crater, 900 feet deep, and Diego de la Haya, 300 feet deep. The smaller of the two, Diego de la Haya, holds a mineral-rich lake whose color changes from an emerald green to bright red depending on the day. The surrounding park is made up of mostly cloud forests, which hold a variety of flora and fauna including Chestnut-mandibled Toucan and agouti. This towering volcano is an astounding beauty unparalleled by much else. Turrialba Volcano National Park is situated along the southeast side of the Central Volcanic Corridor, in the Central Highlands of Costa Rica. The stratovolcano reaches 10,985 feet into the sky, allowing for views of the Atlantic coast as well as other Costa Rican volcanos such as Poás and Irazú. Though this volcano is one of few to be covered in lush vegetation, it is one of the least visited volcanos in the country. Its surroundings include montane rainforest filled with small animals, and the nearby city of Turrialba. The volcano is certainly active, with its most recent activity in March 2015, which caused the temporary closure of the nearby airport. Prior to the recent eruption, the last major activity was in 1866. This beautiful and underappreciated volcano holds treasures unknown and experiences only found in Costa Rica. 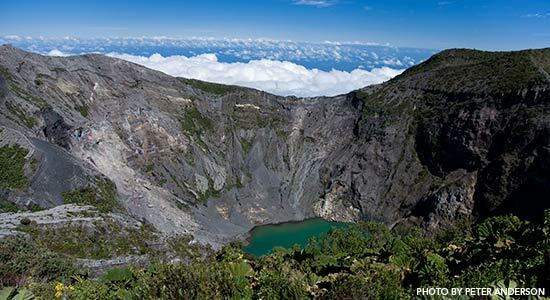 Easily one of the most accessible parks and volcanos in Costa Rica, Poás Volcano National Park sits on 14,000 acres of land and attracts thousands of visitors. The main attraction of this amazing volcano is the craters. The 8,885 feet tall volcano hosts two craters which draw in visitors from all over the world. The main crater, which goes 300 feet down, holds a bubbling, steaming lake that is one of the most acidic lakes in the world, with a pH sometimes at 0. Sulphur in the water can cause acid rain, the effects of which can be seen on the nearby vegetation, or lack thereof. In stark contrast, the second crater holds nutrient-rich Botos Lake, which is surrounded by thick green vegetation and diverse fauna. The active volcano causes steam and geysers to be seen as high as 820 feet in the air. These amazing craters and exploding geysers are some unique and incredible feats of nature that are sure to amaze. Rincón de la Vieja is a cinder cone volcano made up of nine craters that dot the national park the volcano lies within. The park is covered in tropical forests containing extensive flora and fauna. Wildlife includes peccaries and howler monkeys along with many other creatures amidst the trees. Some attempt to hike to the summit by a weaving path up 5,000 feet to the 6,217-foot-high summit. The endeavor is not without reward though, giving the opportunity to see the different ecosystems as play and a stunning view from the top. The volcano is part of the Guanacaste Mountains, and is most active in the range. The most recent eruption occurred in 2011, though steam and other minimal activity can be seen almost year-round. 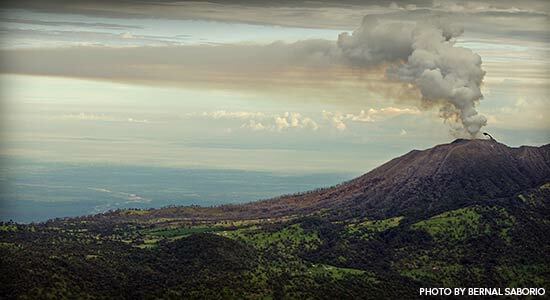 This sprawling volcano is an impressive, one of a kind landmark of Costa Rica.